I am sure that most of us have found ourselves in the situation of having to travel during a time of loss. Whether it be to a city close by or across the country, or even across the world. Are we ever really prepared to make this journey? Our heart is heavy, we cry silent tears, the world will never be the same. We wonder, is it really possible to find beauty through grief travel? During the Christmas holidays, this is exactly what happened to me. The weekend before Christmas, I received the dreaded telephone call. My young niece of a mere 25 years had passed away quite unexpectedly. For the rest of the day and night, I was rendered immobile. I was in a complete state of shock. My heart broke for my brother and his wife, and for a young life taken too soon. The following day I knew that I had to get it in gear as I only had two days to make arrangements to get to Kelowna, British Columbia (a 4.5 hour flight away), for my niece’s Celebration of Life. Panic time had now arrived, as the next day was Christmas and I was hosting my family Christmas on Boxing Day. That left me one day in which to get a flight, get packed, make arrangements for my puppy, and arrange a couple of extra days off of work. So many things were going through my mind. Christmas is always the busiest time of year for airlines, transportation, and doggy daycare, not to mention the most expensive time to travel. I began to worry that I wouldn’t be able to get a last minute flight. Luckily for me, I am a frequent traveler and I have everybody on speed dial. I contacted Westjet directly rather than booking online. The agent did everything she possibly could to get me a flight out, and back, at a considerably reduced rate. It was still more expensive than usual given the time of year, but I did manage to get a reduced rate of around 35%. Pro Tip: If you find yourself having to book a flight to attend a funeral or seriously ill family member, contact the airline directly to see if a bereavement rate is available. I eventually found doggy daycare for my puppy (out of the city). Arrangements were made for my transportation to and from the airport. I was able to arrange with work to have New Year’s Eve day off. Now to pack. Because I am such a frequent traveler, I am usually prepared for last minute getaways. I typically keep my toiletries packed, and since I was only going to be gone for two days I didn’t have a lot that I had to pack. In less than 24 hours, all arrangements were made and puppy was at his daycare. I was exhausted, but I was reluctantly ready to take off. On the day of travel I knew that it was necessary for me to get as much rest while travelling as I could. Even though the flight itself was only 4.5 hours, with layovers and commuting time I knew it was going to be a 12 hour day. I also knew that when I arrived at my brother’s house all hell would be breaking loose and people would be coming and going. I was totally dreading this trip! As my flight was descending into Kelowna, my dread turned into complete awe. I was speechless. The vast mountain ranges and lakes which surround Kelowna were breathtaking. I had heard that Kelowna was a beautiful area, but I was not prepared for what was waiting for me! It was at this moment that I discovered that there could be beauty through grief. 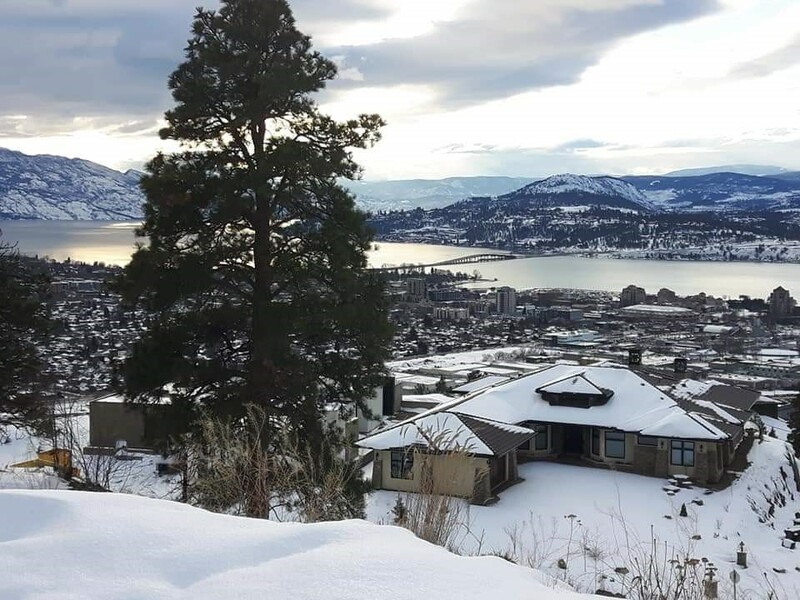 Kelowna itself is an eclectic city located in the Okanagan Valley in Western Canada, situated along the eastern shores of Okanagan Lake. The city is surrounded by parks, lakes and vineyards and is the perfect place to visit for the outdoor enthusiast, like me. Kelowna is also the perfect place for artisans as well. In fact, my brother is an artist living in Kelowna and my sister-in-law owns the local art gallery, which displays artwork created by the locals, as well as artists worldwide. In order to save money and to make it easier for me to help my brother and sister-in-law, I stayed at my brother’s house, which was located in an upscale subdivision high up in the mountains overlooking the city. Lake Okanagan was also visible from his home. It truly was an oasis in the middle of the city, which surpassed any hotel or resort that I could have stayed at. Because of the mountainous location, many deer and other wildlife frequented the yard. They were so much fun to watch as they fed on my brother’s shrubs and lazed in the sunny yard. This brought a smile through my sadness. My brother wasn’t impressed that his shrubs were being destroyed lol. The first full day in Kelowna was my niece’s Celebration of Life, which was held at my sister-in-law’s art gallery, Sopra Fine Arts. People from all across the globe flew to Kelowna to celebrate my niece’s life. While it was a time or mourning, it truly was a celebration of her love of life and adventurous spirit. The Kelowna people were full of love and the affection they felt for my niece was truly evident by their words and through their tears. With my brother always being the ultimate host, on the Sunday after everybody had flown home, we grabbed a coffee from Starbuck’s and he took me on a tour of the area. We drove the steep hills higher up into the mountains where I felt like I was on top of the world standing mesmerized by my surroundings. We drove along Lake Okanagan which was partially frozen and sparkled like diamonds. We stopped at Mission Hill Winery and explored the sculptures scattered throughout the vineyard, while I marveled at the beauty of the surrounding lakes and mountains. There’s not much better than wine, lakes and mountains all in the same place. I was completely in my element. They do say that the things you dread the most, usually turn out the best. Even though this last minute trip was heartbreaking, it was the best two day getaway I have ever had. I can’t wait to return to beautiful Kelowna when I can stay a little longer. I returned home feeling at peace, with love and joy in my heart taking over my feeling of loss and sorrow. This journey was truly a life altering experience for me. For the first time, I realized that it is possible to find true beauty even when filled with grief and sorrow. I am certainly not saying that travel will heal your grief and take away your sorrow as the sadness will be carried in your heart forever. I do know now that it is possible to find beauty again through grief travel. You just have to open your heart and your eyes to truly see and experience the beauty surrounding you. Lovely blog post, thank you. I am sorry to hear about the death of your young niece but so pleased you managed to find some solace in a beautiful place. Thank you so much Carol. It really was a beautiful part of Canada. I always wanted to go there. Thank you for your kind words! It is now one of my favourite places and I’ll for sure let you know when I’m going back! Thank you for sharing such a personal post.